World War One was during a time of industrialism, and mass productions, which resulted in new technologies world wide such as the telephone, the automobile and other everyday uses. Along with all of these everyday technologies, came war technologies. New ideas and new ways of production helped produce the war technologies such as trenches, machine guns, tanks, airplanes, poison gasses and flame throwers. These new technologies changed the face of war forever. 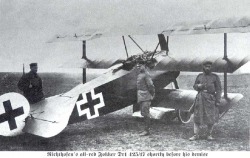 The first war planes were specifically made for World War One. Planes allowed pilots to bomb and shoot their enemy, as well as cities, resulting in a lot of damage. These planes were the first fighter planes to have sky battles. 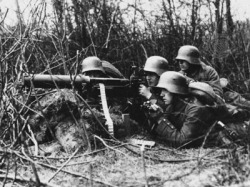 Soldiers using a machine gun. The machine gun allowed soldiers to shoot many rounds of ammo in short amounts of time, alomst always being very lethal. 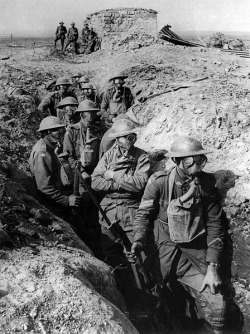 These soldiers are using gas masks to protect them from another new technology of the war, poisonous gas. Enemies would use these gases to blind their opponents, or burn their insides from the inside out. They were very lethal, but had some drawbacks. The gas would blow wherever the wind was blowing, somtimes resulting in a backfire.